On Thursday 4th December the Institute hosted a lecture by international opera director Stephen Langridge which looked at Shakespeare’s works in operatic form: why Shakespeare is the author of choice for so many composers; why operas of his plays succeed not just as adaptations but as works of art in their own right; the difference between directing a play and an opera and the techniques required by both; what’s gained and lost in the translation to opera. At the same time we were given a more general fascinating insight into how opera works. 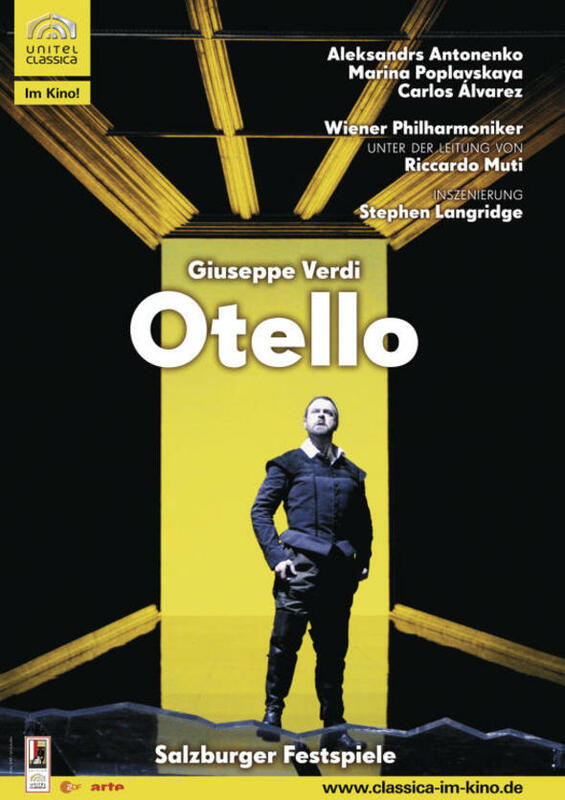 In this exploration Langridge took the example of his own staging of Verdi’s Otello for the Salzburg Festival in 2008, conducted by Riccardo Muti – a production which he admitted was not given the greatest of receptions when it opened (booing was mentioned!). Despite this fact his description of his staging sounded full of illuminating and innovative touches. Having a background in writing about the staging of Shakespeare’s plays and by no means being an expert in opera, I wondered if there was anything discernible in the staging that could have caused such offence to any audience. By very good fortune (and an excellent purchasing policy!) at the SIL we hold a copy of the DVD of this particular production. The recording of live performance was discussed at the lecture and the limitations of that form but here was one of the main benefits – being able to watch what otherwise would have been lost. The fact that I have already ordered my own personal copy of this production provides a clear indication that I have issues with that Salzburg audience’s response. Beautifully performed, beautifully staged and incredibly moving – what more could one want?! In the staging of this and his other operas Langridge mentioned important first conversations with his designer, in this instance George Souglides, and it’s this collaborative and symbiotic approach between designer and director that seems key to this staging’s success. 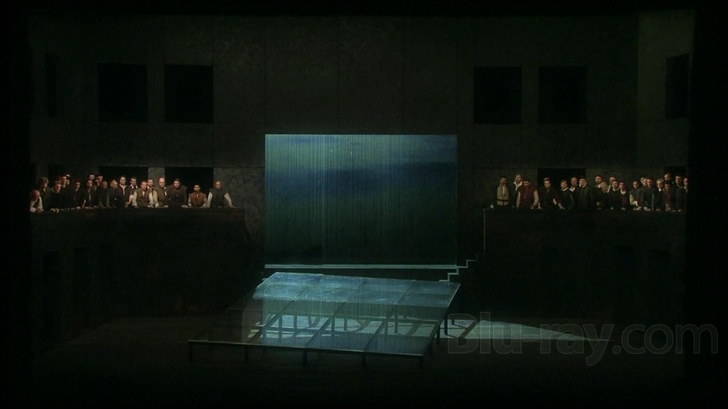 In the opening scenes one is struck by the massive scale of the set and the production at the Grosses Festspielhaus. This scale is masterfully manipulated for the large set pieces and broken down into different acting spaces by use of several devices: a raised, tilted thrust stage made of glass that dominates the central performance area, a Victorian proscenium curtain, back video projection, a fissure which splits the stage in two during the first dramatic storm, tiered levels of space, galleries and areas of light and shadow. These techniques seamlessly enable the large stage area to encompass the intimate and the epic nature of the play. They also take the audience through different spaces in time, literally, different stages in which the play Othello has been enacted and interpreted in different centuries. Although costumed in Elizabethan dress by Emma Ryott, this gives a sense of the timeless nature of the play. Othello, becomes a ghost story – the torment of Othello and Desdemona carved in the fabric of time, fated to be repeated – be acted over / In states unborn and accents yet unknown. Jago’s manipulation of the characters and the action of the play is demonstrated by his control of scenic elements. He moves the large curtain across the front of the stage, steps in front of it and asserts himself as a villain in high Victorian Gothic style. 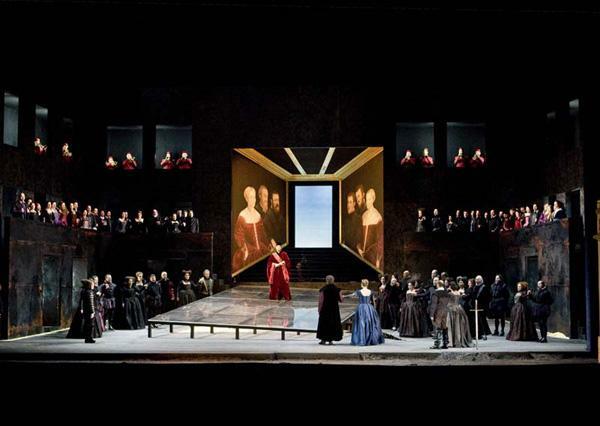 He controls Otello’s vision of the world but he also controls the audience’s by moving the curtain back and forth in order to obscure or reveal. The production has tremendous build with the scenic elements intrinsic to the action and emotions of the characters. As the play progresses the elements which divide the stage are progressively stripped away. The curtain is pulled down by Otello, the fragile looking glass stage spectacularly cracks in two. These elements removed we are left with an empty cavern of a stage for one of the most intimate and devastating of scenes, the murder of Desdemona. How characters occupy the space and relate to each other within it clearly signal the dynamic of relationships within the play. There is highly effective use of blocking in different stage areas to create a mirroring effect of characters for certain scenes. 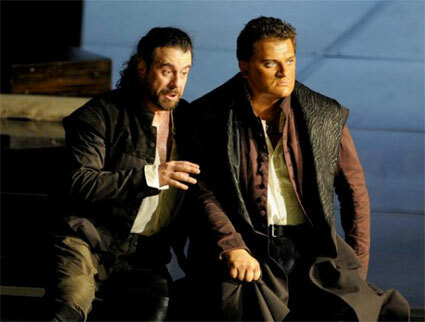 For example, in the scene where Jago pours his poison into Otello’s ear he inhabits the same space in relation to Otello as Desdemona in an earlier scene. We are given a clear visual echo – we can see how Jago inhabits Desdemona’s place, how her song of true love is replaced by his false expressions of loyalty and devotion, the angelic replaced by the demonic. This movement in the plot climaxes with the blood oath that Otello and Jago make, replacing and destroying the marriage vow – Otello gives his soul not in love but in hate, he exchanges light for darkness and shadow. In Verdi’s coruscating quartet “D’un uom che geme” in which Otello and Desdemona duet at the same time as Jago and Emilia, Otello and Desdemona inhabit the stage’s ground level in which many scenes of raw emotion take place; Iago and Emilia stand on the fragile glass stage – a strange distorted mirror reflection of two relationships in danger. Both women are bewildered and in a state of anxiety but while one looks imploringly to her husband the other is too afraid to see into the darkness only vaguely hidden in her husband’s face. The staging of the final scene is devastating. All show, all façade, the grand trappings of dramatic history in the set are gone and the scene is bare, dark and desolate for Desdemona’s murder. She lies on a large black blanket which appears like a dark residual wave from the opening storm waiting to swallow her up. The intimacy of the scene is generated by a single candle on the stage in front of her. She has gathered up the pieces of a statue of Venus given to her by the children of the island which Otello in his rage had earlier smashed against the back wall. The Goddess of love, innocence, beauty and sensuality destroyed, she attempts to restore them like a child trying to piece together a best loved broken doll. At the end of her sublime aria “Ave Maria, piena di grazia” she reaches towards the candle which illuminates her in the darkness of that vast stage, but she withdraws her hand from extinguishing it like a child afraid of the dark, or one aware that her soul and the flame are intrinsically linked. She curls up in a foetal position and cries herself to sleep. Her vulnerability emphasised the emergence of Otello from the darkness of the fissure in the stage, the abyss of hell, gives a real frisson of terror. Otello by this stage has undergone a death himself. Jago’s triumph over him is Miltonic – the glass stage on which they stand splits in two. Othello tumbles from the lower half to the ground apparently lifeless. The upper part of the broken jagged glass angles upwards with Jago, and evil, firmly in the ascendence. His demonic stature firmly established. Otello may extinguish her light and life, but Desdemona always remains visible, almost luminous and ghost-like in her ivory night dress – her innocence radiates from the contrast of light and dark. Otello’s suicide takes place at the right-hand side of the stage on the other side of the fissure from Desdemona. He crawls towards her body but dies separated from her with the abyss between them. This leaves the audience with an overwhelming sense that their souls are separated forever. In stagings of Shakespeare’s play Othello almost always dies on the bed next to Desdemona on that final kiss – there is hope that their souls may be reunited by a benevolent God – but we are left with no such feeling, the tragedy is heartbreakingly complete. In this production of Verdi’s great opera, direction and design come together in a way that illuminates, immerses and transports you into that world and the emotions of that work. Stephen Langridge indicated that he felt he had gone wrong with this staging by going too much back to his Shakespearean source. He commented that the audience considered it too conventional. Not sure about that – but then I’m coming from a different background and cannot see the perceived weakness in the production – apparently an equally discerning Italian audience loved it when it as performed in Rome. If you want to judge for yourself then pop into the SI Library and have a watch! 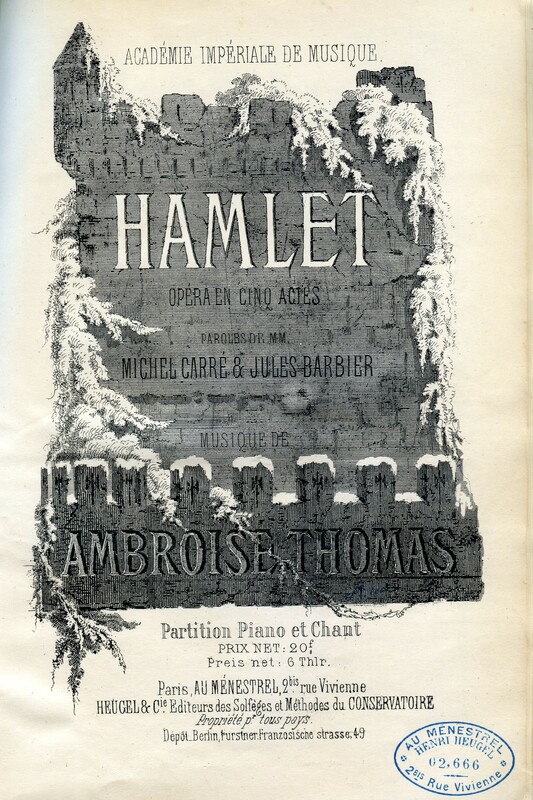 In 2016 Langridge will be directing Thomas Ambroise’s Hamlet (of which the University of Birmingham holds the first printed piano score from 1868 – showing off again! ), and Verdi’s Macbeth. Prokofiev’s ballet of Romeo and Juliet will also be staged, along with other events to mark the 400th anniversary of Shakespeare’s death in style at Gotenburg Opera. Given Stephen’s marvellous lecture, his great insight and imaginative approach to the works of Shakespeare this will be something worth experiencing – I heard both students and staff already planning their transport arrangements! This entry was posted in Uncategorized and tagged design, direction, Emma Ryott, George Souglides, Gothenburg Opera, Grosses Festspielhaus, Karin Brown, opera, Otello, Riccardo Muti, Seminar, shakespeare, shakespeare institute, shakespeare institute library, Stephen Langridge, Verdi by silibrarian. Bookmark the permalink.